Summary: Governor Alfred Landon of Topeka, Kansas, appeals to the Red Cross office in St. Louis, Missouri, for drought relief assistance. A survey of drought conditions in Southwest Kansas had revealed desperate conditions. Landon, 1887-1987, had already negotiated emergency freight rates with railroads operating within the state. 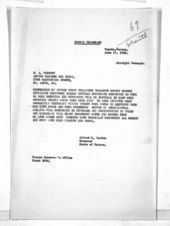 See F. A. Winfrey, Red Cross, to Governor Alfred Landon, dated June 17, 1933.